At the 1964 World's Fair in New York, the public experienced the first "picturephone" linking video with phone calls, saw the next level of robotics in Walt Disney's "It's a Small World" ride, and were able to ask a computer a question and get a response in seconds. 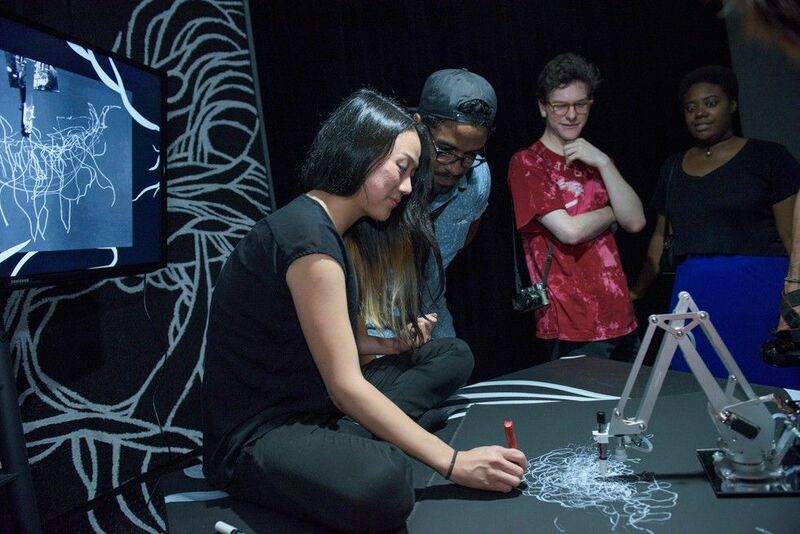 Fifty years later and lightyears ahead in our technological predictions, a smaller, hipper and more artistic tech fair conducted by NEW INC, The New Museum's incubator for art, design and technology, has come to Red Bull Studios New York to show off a whole new type of future. At the interactive showcase open to the public until July 30th, the NEW INC's inaugural class have displayed collaborative projects that bring innovation, excitement and a sense of humor to the ever-expanding art and technology field, introducing a drawing robot instructed by Sol Lewitt (with its own Twitter handle), a fog maze, a rapping cotton candy machine, an addictive app that tests color perception, and of course, a GIF photobooth. "They have found a common language and common identity that comes from a place of not fitting in," says Julia Kaganskiy, the director of NEW INC, of the incubator's collection of artists, designer and programmers. "When you're working across disciplines we are so used to these silos, and when you are someone who is interested in combining fields, people don't know what to do with you or talk about your work." Surrounded by the collaborative projects at the showcase, however, the blending of fields feels like a natural progression of both technology and art, with a refreshing sense of wonderment. Upon entering the space, guests are immediately invited to play. Weave through a hanging forest of shimmering fiber optic "sea urchins," a collaboration by NEW INC member's Lisa Park and Kevin Siwoff inspired by bioluminescent creatures, that change color with sound. Release synth beats by tapping on glowing Samsung cell phones, arranged in a spaceship type installation, to create a collaborative and interactive cell phone electro band, a project by Odd Division and Luisa Pereira originally created with Swedish band LIttle Dragon for a performance at The New Museum. 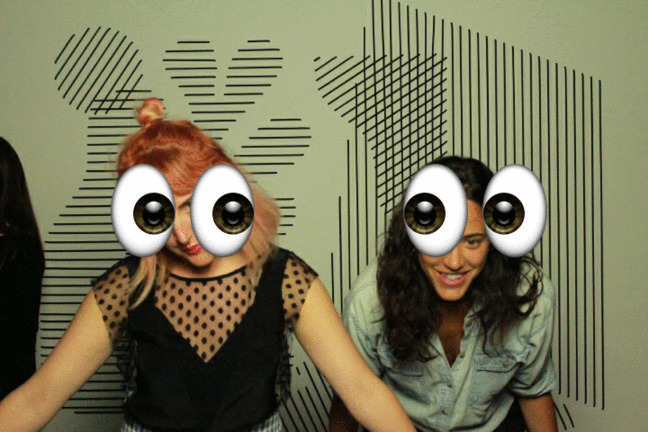 Even the photo booth, a staple now at art and fashion parties, is interactive, with the ability to create and share photo GIFs with custom emojis and filters developed by Pablo Gnecco and Dan Moore. Many of the NEW INC members are involved in a variety of different collaborative projects throughout the space, using their particular specialties to create an eclectic body of work. "We curate the group thinking of it as an ecosystem," explains Kaganskiy on the incubator's selection process. "It's a very peer driven environment as opposed to a competitive environment." The artists seems genuinely excited to create together, like Philip Sierzega and Emilie Baltz whose desks face each other in NEW INC's office space, immediately bonding over their interest to create a multi-sensory interactive experience. Together they developed the Cotton Candy Theremin, a machine which, as a guest spins their own wisps of cotton candy, plays remixed candy-inspired rap lyrics, projects a digital animation of floating sunset colored sugar crystals, and creates the smells and environment of a county fair, but in space. NEW INC's collaborations range from interactive features, art and technology products available for purchase in the Gift Shop, as well immersive site specific installations, like Snowblind created by innovative architecture and design groups The Principals and Studio Studio. In the lower level patio that's usually filled with smokers during Red Bull's crowded event openings, the cigarette smoke has been replaced with a dense fog to create an ephemeral and transitory experience. 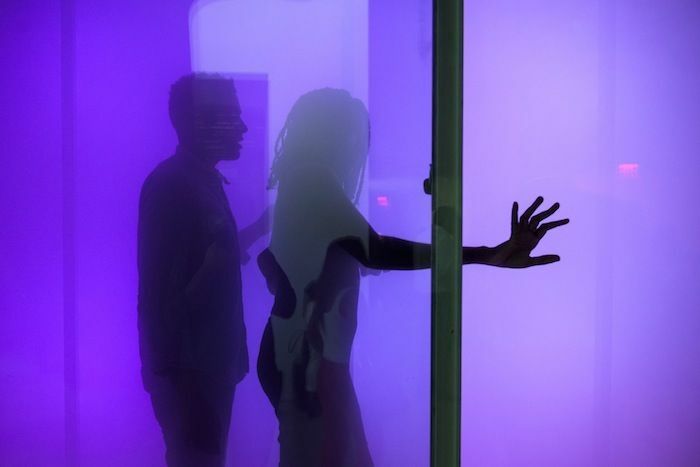 Walking through the narrow room surrounded by tactile clouds that change hue with body movement, you feel as if you are in another world completely. 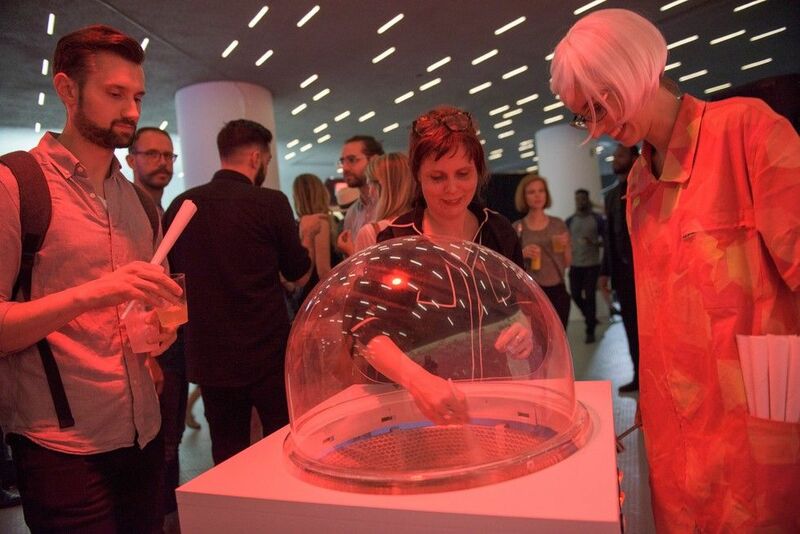 This shapeshifting architecture, together with the many interactive apps, mechanics, and art projects in NEW INC's first showcase, are a not only charming and engrossing, but a truly realistic vision of the future. NEW INC End of Year Showcase will run until July 30th at Red Bull Studios, 220 West 18th Street, New York.